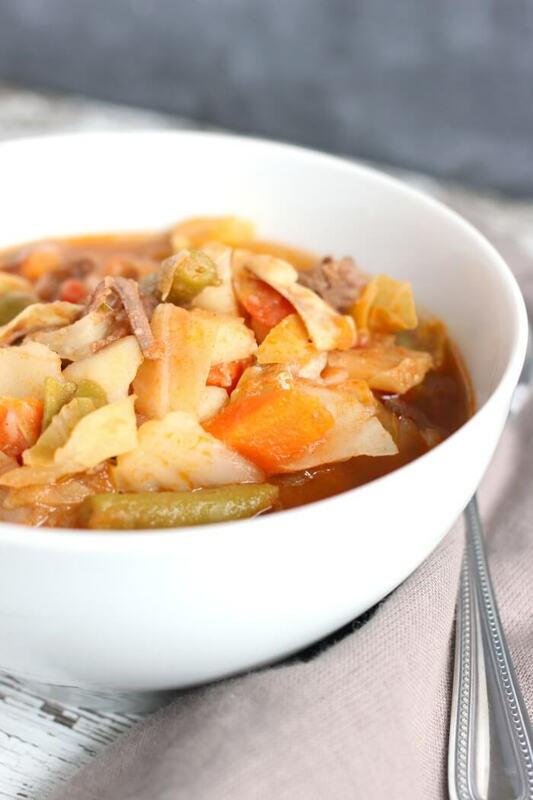 Confession – I’ve made this Instant Pot Cabbage Soup three times in the last two weeks. It’s really good, really filling, and really healthy. The perfect combination! 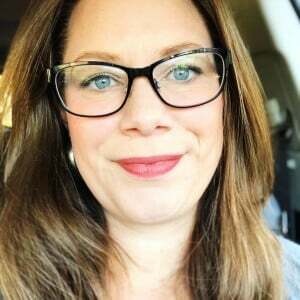 If you watch our live show, you know I’m maybe a touch obsessed with my instant pot. 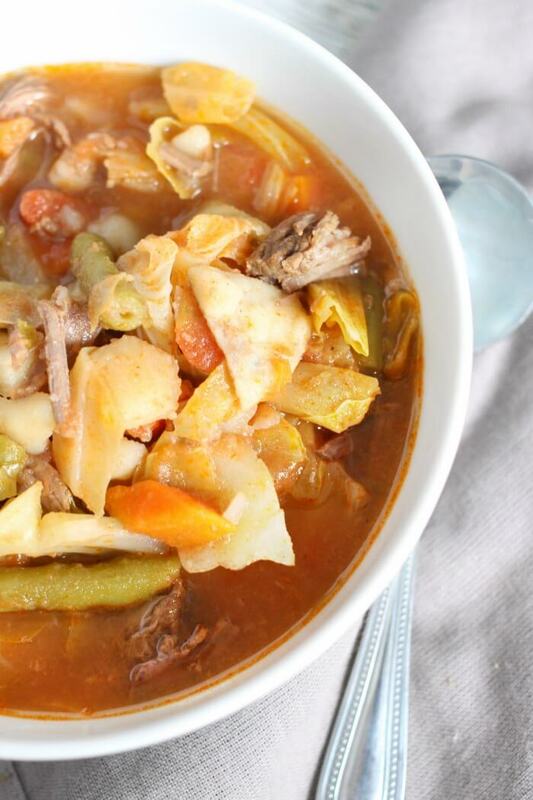 This cabbage soup is my new favorite recipe. Not only do I love it because it’s tasty, but also because the kids like it too. And if you have kids, you know what a huge win that is. Sometimes I like to toss a scoop of cauliflower rice in too, other times I’m a little naughty and soak up the broth with some fresh made beer bread! Our easy cabbage soup is made with just a few simple ingredients. But don’t let that fool you, it’s rich with flavor! And I love that it comes together so quickly. You can make this on the stovetop or in the slow cooker too! In the instant pot the cabbage soup only takes about 45 minutes of pressure, for a total cook time of about an hour. And you end up with the most tender and delicious stew meat. How do you make cabbage soup? 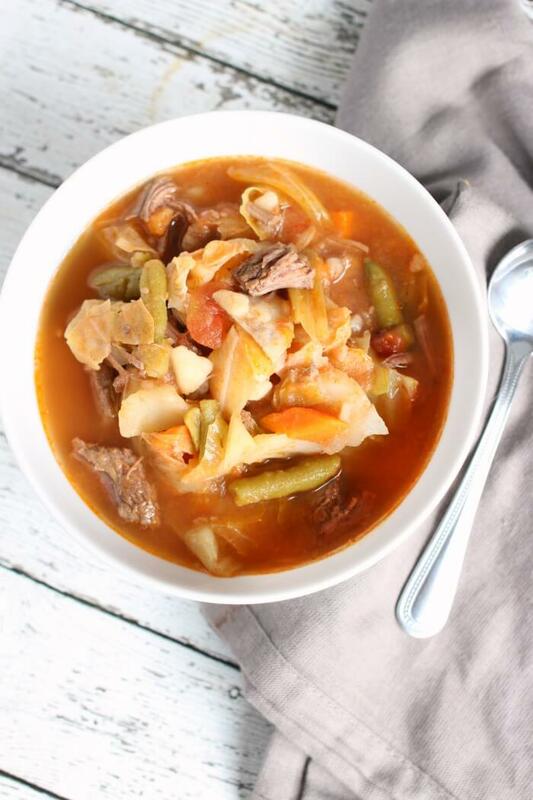 Cabbage soup is made by cooking vegetables and stew meat for a long period of time, until the meat is tender. Then adding cabbage and cooking for a short while longer. 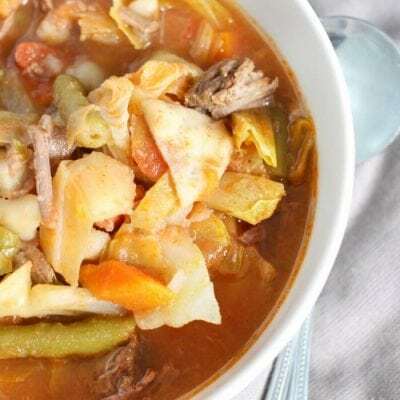 A basic cabbage soup is very simple to make, but can include many variations. What is cabbage soup good for? 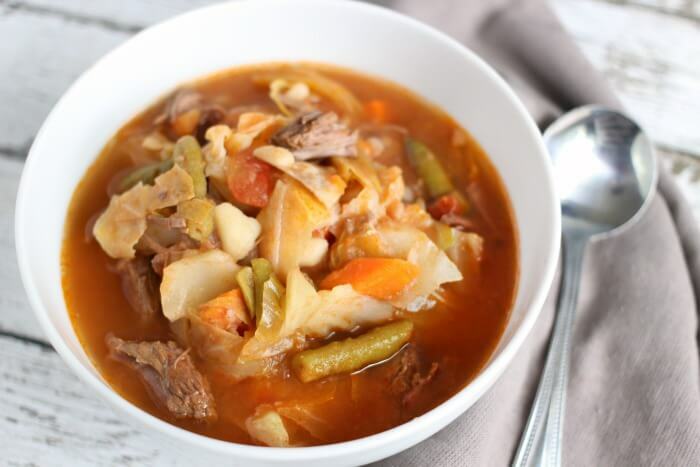 Cabbage soup can be a great option for weight loss. 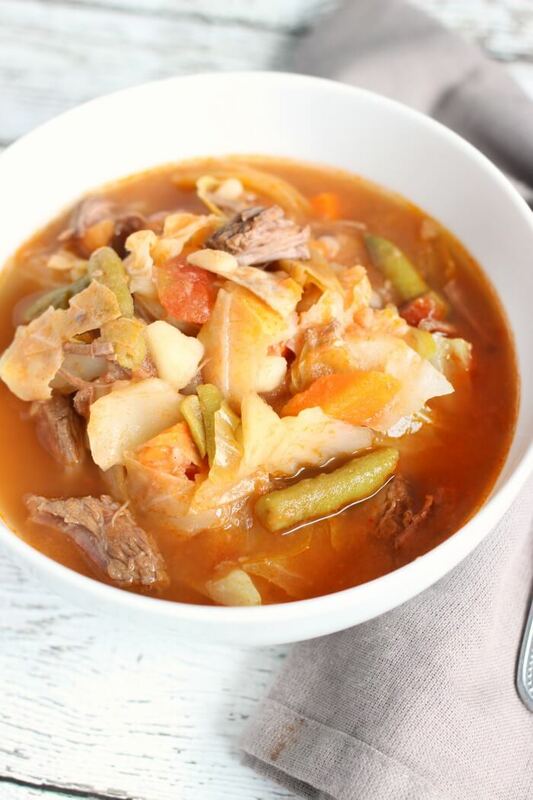 This cabbage soup is full of healthy vegetables, and lean protein from the stew meat. If you’re trying to keep low on carbs, you could add less potatoes, or even skip them altogether. What are the ingredients for cabbage soup? We use a combination of cabbage, potatoes. carrots, green beans, tomatoes, and stew meat to make our cabbage soup. 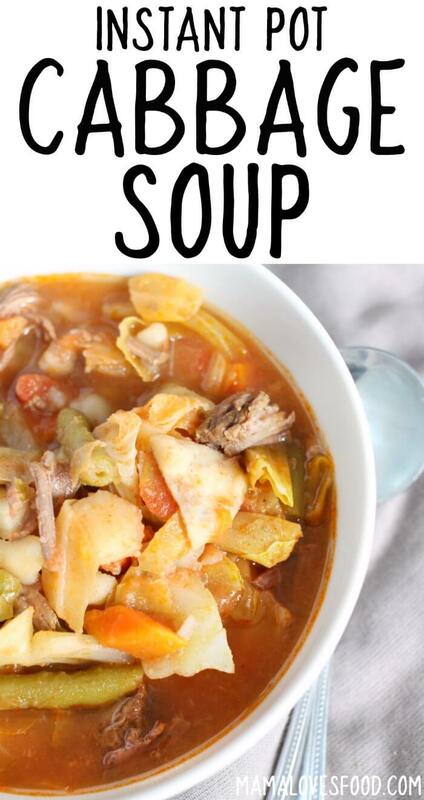 Cabbage soup is a super versatile dish though. A kitchen sink style soup, if you will! So if you have some other veggies hanging around, go ahead and add them. Cabbage soup will be good stored in an air tight container in the refrigerator for about three days. If you’re my dad, you’ll eat it after five days, but I don’t suggest following his lead. If you want too keep the soup longer than three days, then go ahead and pop it in the freezer! What spices to add to cabbage soup? 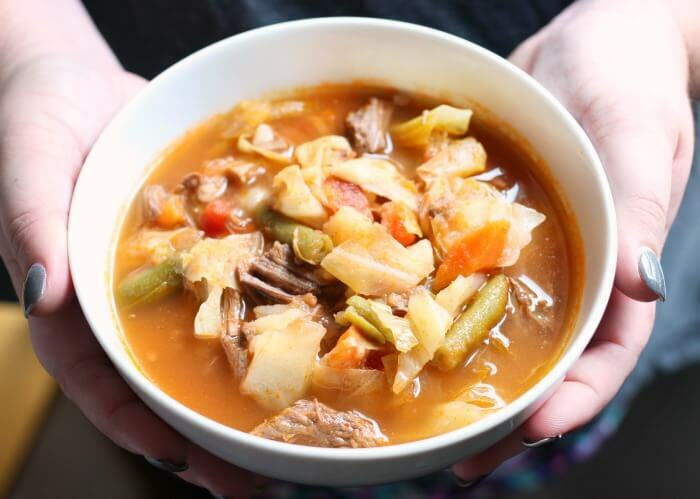 We add very few spices to our cabbage soup – just seasoned salt, and beef bouillon or beef stock. It doesn’t sound like much, but sometimes simple is best. You can also salt and pepper to taste after it’s done cooking. If you prefer yours fancier, garlic or onion would be great additions. How can Cabbage help you lose weight? I don’t claim to be a scientist, but in the most basic sense, cabbage can help you lose weight by being a vegetable that is both low in calories and filling. Sometimes I like to cut my cabbage into thin slices so they’re more like noodles! Instant Pot Electric Pressure Cooker – This is the model I have, and you’ve seen me use it dozens of times on our live cooking show. It’s very very (very) awesome! White ceramic dishware – I love white dishes because you can tell with a glance whether they’ve been cleaned. With five kids, this is a real thing. Ceramic soup bowls – there is literally no such thing as too many bowls. I heart bowls. So much. Colorful cotton bandanas (we use them as napkins!) – sometime around 2012 I decided I’d had enough of paper napkins and paper towels. We were going through such a ridiculous amount and it felt like I was just throwing money directly into the trash. So, I ordered 100 (yes!) bandannas and here we are five years later still using them! It’s perfect. Stainless steel soup ladle – my soup ladle is constantly going missing. Does this happen at other people’s homes? Make sure you tune in and watch all our shows! Turn instant pot to saute mode and brown the stew meat with a small amount of olive oil. Add the rest of the ingredients except the cabbage and water. Stir everything up, and add enough water to cover the meat and vegetables. Make sure there's still some room at the top to eventually stir in cabbage. Cover the soup and turn instant pot to manual mode for 45 minutes. Stir in the cabbage, and cover for an additional 5 minutes. I want to make this soup. I’m sure my husband won’t eat it. As soon as I say “cabbage” soup, he will make a face. 🙂 He likes coleslaw, which is cabbage, but I guess he doesn’t like it cooked. That’s okay, there will be more for me. 🙂 I’ll let you know how it turns out. OMG, yum! Going to make this for my lunches next week! I have to make this this week!! It looks amazing and we love cabbage!! Do you have to use an Instant Pot for these recipes? What size instapot did you use? I have an 8 quart and wondering if I can double the recipe. Thanks! can you use chicken instead of meat. or vegan? no meat at all? any of those options would work. if you did vegan you’ll want to use a good vegetable stock or broth to make sure you still have a lot of flavor.